The Media Hotel & Towers has recently welcoming producer and tv crew of Excellent TV as they were using the hotel as location for a TV talkshow shooting titled “ Excellent Business” at Lower Lobby area, The Media Hotel & Towers. Excellent Business is a talk show that is aimed as an inspiration and motivation dedicated to the public by featuring entrepreneurs, authorities and the people who pursue a career with hard work from nobody into a successful one. On this occasion Excellent Business present some entrepreneurs as speakers such as Mr. Bing as a stationery entrepreneur, Mr. Eddy as digital printing entrepreneur and Mr. Frans as an Mineral Water entrepreneur. Seen in the picture below, tv crews who worked to prepare the tv shooting. 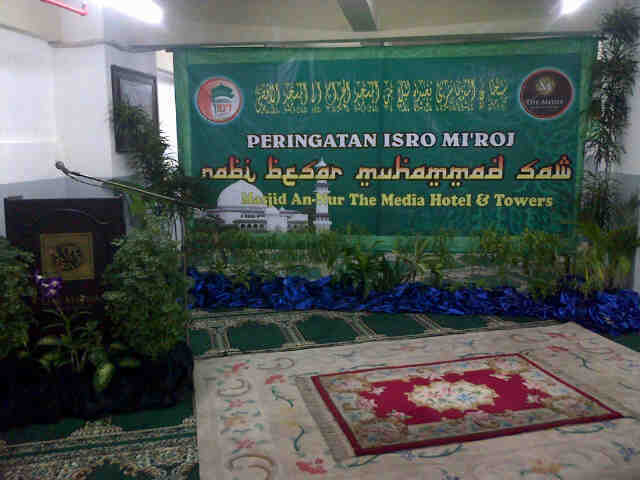 Isra Mi’raj at The Media Hotel & Towers Jakarta. Marhaban ya Ramadhan to Commemorate The Isra & Mi’raj The Media Hotel & Towers has recently held a kind of activity at Masjid An-Nur The Media Hotel & Towers, such as Reading of the divine kalam, Islamic music Tambourine and Tausiah. The Media Hotel & Towers Associate are really Enthusiastic to attended the events of Isra Mi’raj. The Isra and Mi’raj (Arabic: الإسراء والمعراج‎, al-’Isrā’ wal-Mi‘rāj), are the two parts of a Night Journey that, according to Islamic tradition, the Islamic prophet Muhammad took during a single night around the year 621. It has been described as both a physical and spiritual journey.A brief sketch of the story is in sura 17 Al-Isra of the Qur’an and other details come from the Hadith, supplemental writings about the life of Muhammad. In the journey, Muhammad travels on the steed Buraq to “the farthest mosque” where he leads other prophets in prayer. He then ascends to heaven where he speaks to God, who gives Muhammad instructions to take back to the faithful regarding the details of prayer. Pada hari Sabtu, 22 Juni 2013, tim The Media Hotel & Towers dan tamu yang menginap dengan paket liburan “Historical Journey Package”, berkunjung ke tempat-tempat bersejarah di Jakarta. Setelah selesai menikmati santapan pagi di The Breeze Cafe, tur diawali dengan mengunjungi Istana Negara. Sebelum berkeliling ke dalam istana, rombongan terlebih dahulu menyaksikan film mengenai sejarah istana mulai dari tahun berdirinya gedung pada 1796 hingga saat ini disertai sejarah pemerintahan Indonesia. Tur diakhiri dengan makan siang bersama sama dengan seluruh tim dari The Media Hotel & Towers dan tamu. Dari pukul 19.30 – 20.15: akan diadakan seremoni pemotongan tumpeng yang berlokasi di kantor Gubernur DKI. Akan dihadirkan 486 tumpeng berukuran kecil sebagai symbol dari usia kota Jakarta yaitu 486 tahun, dan juga ada sebuah tumpeng berukuran besar. From 20.00 – 23.00: Pertunjukan secara langsung dari Trans TV di seputar area Monas. From 20.00 – 23.00: Jakarta Night Festival di sepanjang jalan Sudirman – Thamrin. Kedua jalan utama ini akan ditutup karena aka nada beberapa panggung yang menampilkan berbagai hiburan dan pertunjukan dengan detil di bawah ini. From 19.30 – 20.15: there will be a ceremony of cutting rice cake in front of the Governor office. They will have 486 pieces of small rice cake and one giant rice cake size 486cm to mark the 486th anniversary. From 20.00 – 23.00: Live show in Monas Area by Trans TV. Where does one go for the pleasure of enjoying a delicious traditional food of Betawi with The Atmoshpere of Jakarta Tempoe Doeloe? The Deli Cake Shop answer that question. Ahead of the anniversary of the city to 486 The Deli Cake Shop currently offering special promotion called “Betawi Food promotions”, a promo that offers the best delicacies typical of the city Betawi. 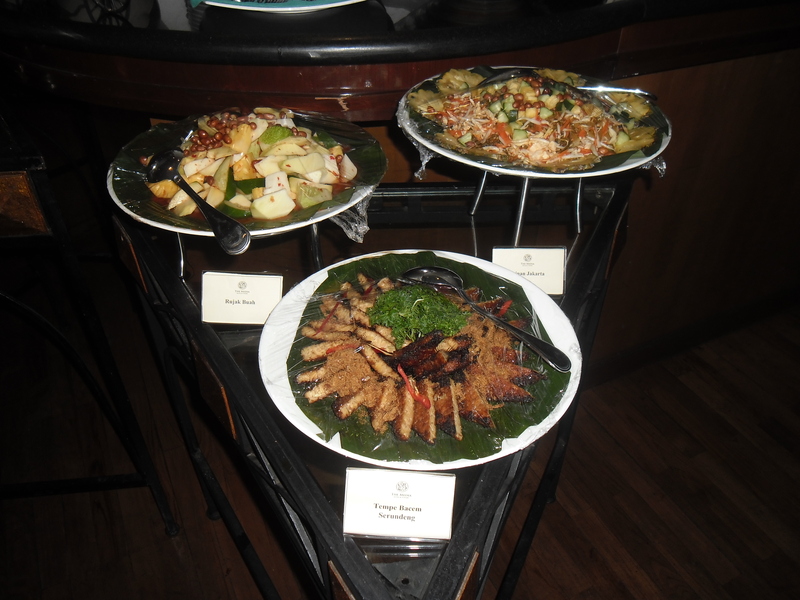 Variety of Betawi culinary specialities will be presented to pampers our hunger. Soto Betawi, one of the most popular foods in Jakarta contains of beef, potatoes, tomatoes, scallions, complemented with coconut milk.Seasoning on soto feels right on the tongue. Give a bit topping of the piece of meat and a sprinkling of garlic is so delicious. It’s not finish yet after that there is soto tangkar like soto Betawi. The difference lies in the color of the liquid. Soto Betawi is white, while soto tangkar yellow almost red. Contents, no beef with fat and beef offal. And for the Beverages is the Beer Pletok, Beer Pletok made from ginger juice, sugar, basil flower and roots. When we drink beer pletok, first tasted spicy, but later the body will feel warm influence of the herb contained in it, uniqueness of this drink ia it’s doesn’t use alcohol. Other special options are Wedang Ronde, a warm drink with ginger flavor with the contents of balls of glutinous rice stuffed with a savory peanut. They still have many of food options Betawi very tempting as Asinan Jakarta, Rujak Juhi, Soto Tangkar, Pencok Ayam, Pepes Ikan Mas, Gulai Kambing ala Betawi and various snacks Betawi. 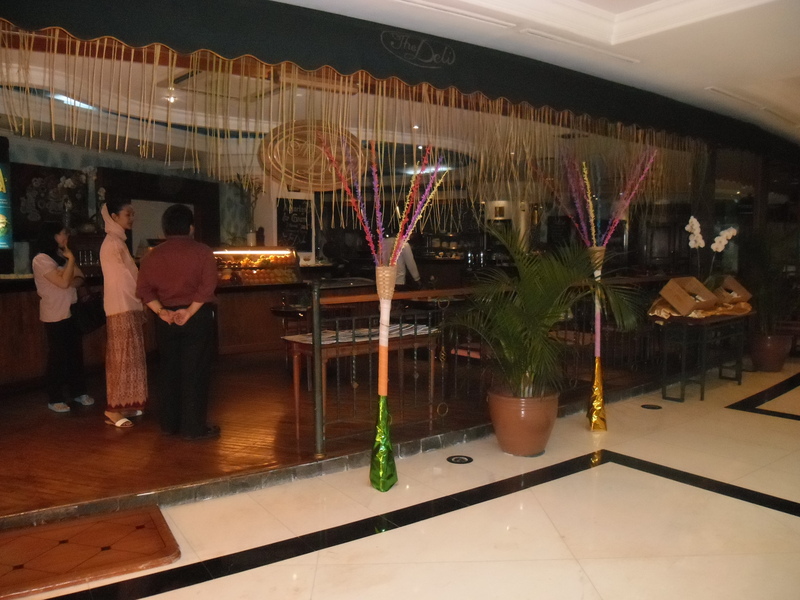 All dishes specially prepared by experienced chefs are owned by The Media Hotel & Towers Jakarta. With the affordable price only Rp 125.000, – net per person guests can enjoy all the Betawi dishes at 18:00 to 22:00 starting from 17 June to 22 June 2013. 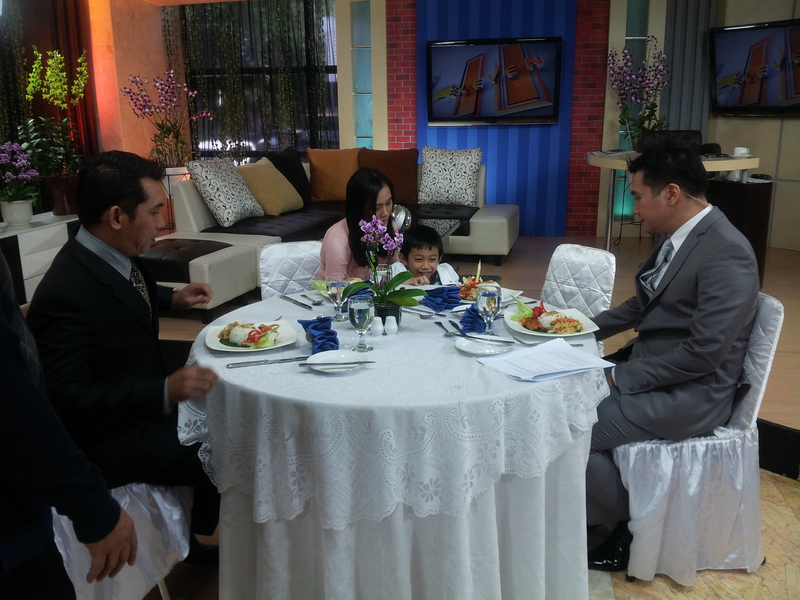 The Media Hotel & Towers was proudly invited to 8-11 show Metro TV. On this informative daily show hosted by Ralph Tampubolon, our executive chef, Mr. Aji Sutarman was demonstrating on how to cook “Udang Pelalah” and “Jukut Urap”, two of favourite menu at The Media Hotel & Towers. Another appearance was from Mr. Herinova, F&B Director of The Media Hotel & Towers, who explained about the necessary of teaching our kids about Table Manner. This show was live from grand Studio lobby, Metro TV. Seen in the pictures, activities during the show. 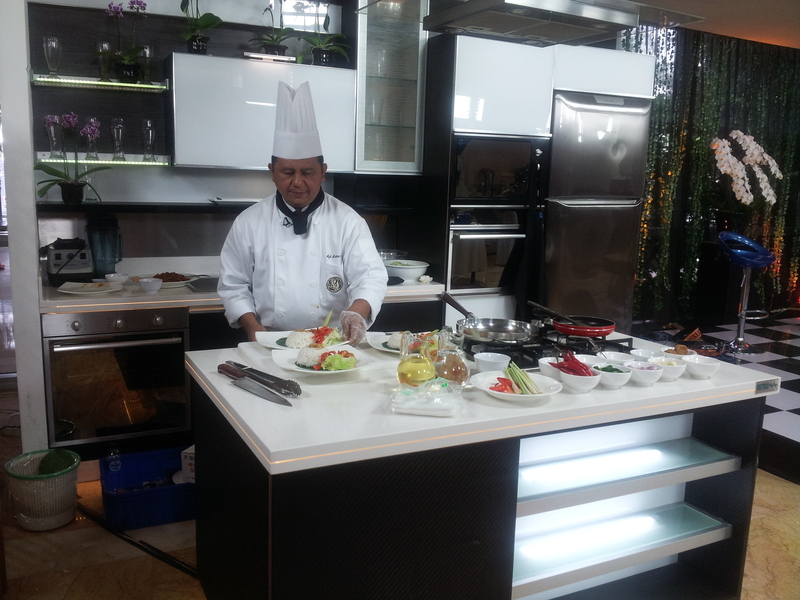 Executive Chef Aji Sutarman went demonstrating on how to cook “Udang Pelalah” and “Jukut Urap”. 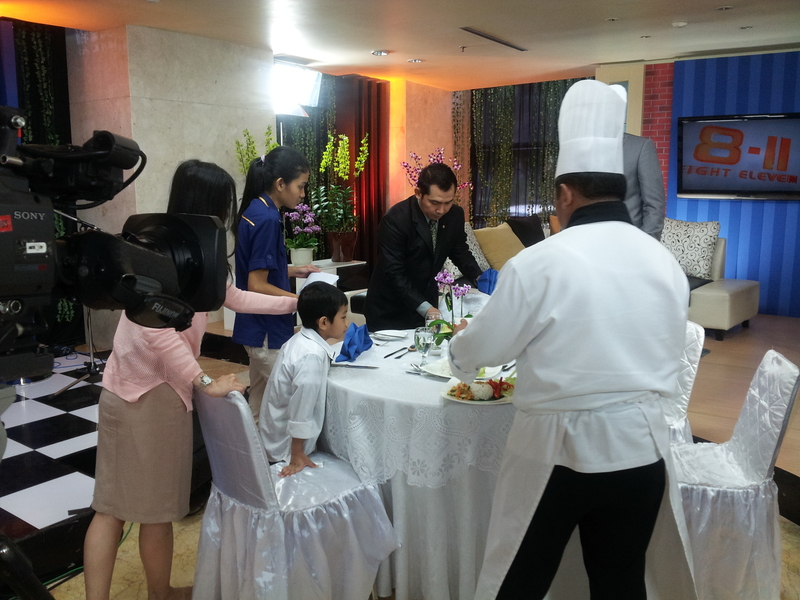 Executive Chef Aji Sutarman and Food & Beverage Director Heri Nova went Serving food and preparing table manner set up. 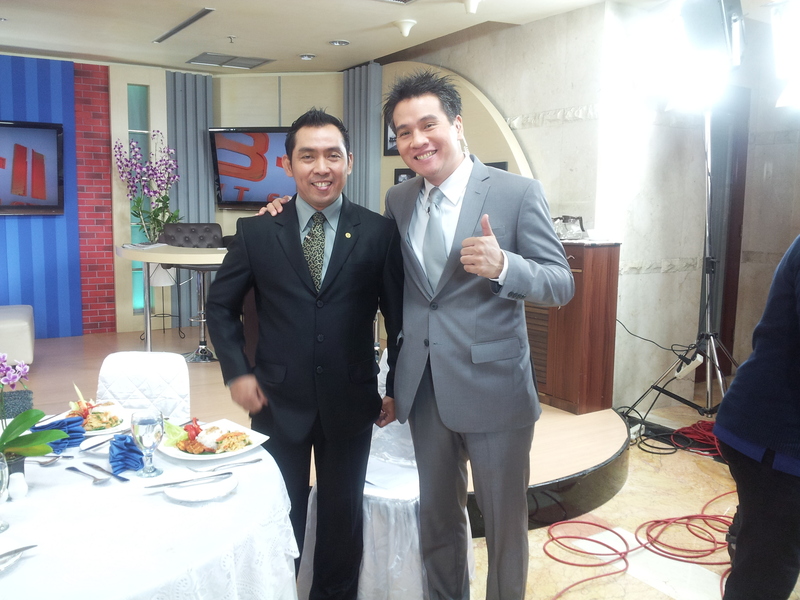 (Left) Heri Nova, Food & Beverage Director The Media Hotel & Towers with Ralph Tampubolon (right) Presenter of 8 -11 Show Metro Tv. 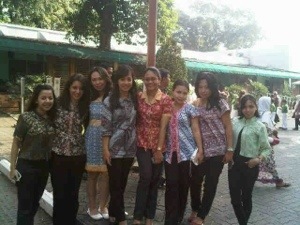 Food & Beverage Director The Media Hotel & Towers, Heri Nova during teaching about table manner. Wednesday, June 12th 2013 The Media Hotel & Towers has conducted General Association Communication Meeting at STAR Café located on annex building at 3 floor The Media Hotel & Towers. Associates from various departments, management and representatives from owning company attended the afternoon gathering. The event started with warm speech from Bapak Algamar Idris as General Manager The Media Hotel & Towers Jakarta, an encourage presentation about company development was presented by leadership team member and Media Awards presentation for outstanding performers from our Associates. 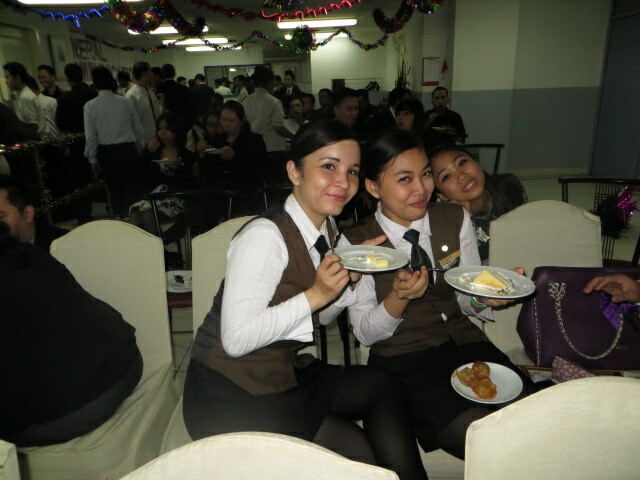 All associates are enjoyed the gathering and were treated with wide varieties of delicious food and refreshing beverages. Associates enjoyed the general associates meeting. 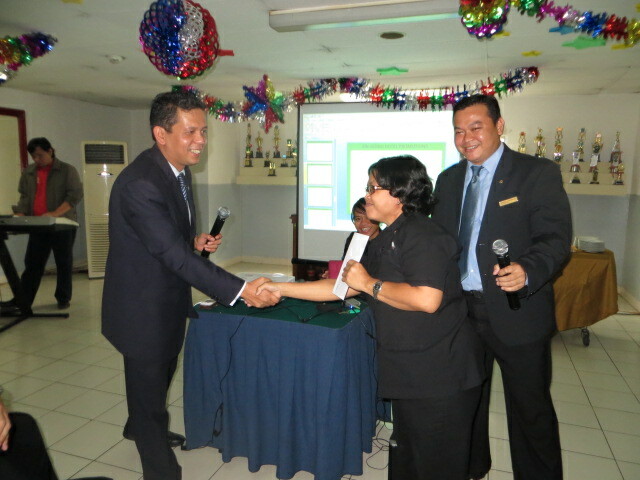 General Manager Algamar Idris (left side) went give lucky draw door price to associate. 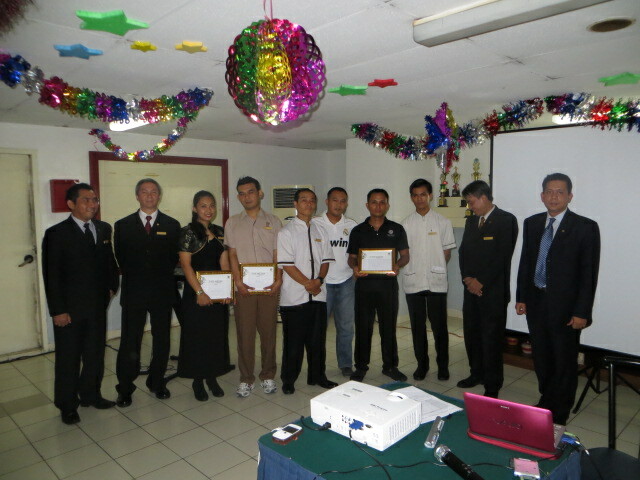 General Manager Algamar Idris (first from the rightt) with rewarded associates.